Obituary for Alberta J. 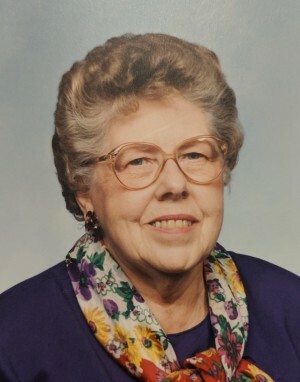 (Keller) Myers | Beatty-Rich Funeral Home, Inc.
Alberta J. Keller Myers, 97, of Ruffs Dale, Pa. died peacefully Wednesday April 3, 2019 at Excela Frick Hospital in Mt. Pleasant, Pa. She was born November 28, 1921 in Ruffs Dale, Pa. Daughter of the late David and Lulu Billick Keller. Prior to her retirement, she worked with her husband Charles at the family business Myers Farm Service in Waltz Mill, Pa. as the bookkeeper. She was a former member of the Sewickley Presbyterian Church. Alberta enjoyed cooking, baking, crafting, square dancing with her husband and spending time with her many friends. She traveled often with her son Brian to various places throughout the world. She was well known as a seamstress, she loved going to Curves Fitness to workout and exercise and she religiously read her daily devotional prayers. She is preceded in death by both parents, husband Charles I. Myers, three sons – Terry, Kelvin and Dennis Myers and several brothers and sisters. She is survived by a son – Brian Myers of Orlando, FL, one daughter Charlene Campolongo and husband Robert of Morgantown, WV., five grandchildren and 6 great grandchildren. Friends will be received from 2-4 pm and 6-8 pm on Sunday April 7, 2019 at the Beatty-Rich Funeral Home, Inc. Rt 136 Madison, Pa. Services will be held on Monday April 8, 2019 at 11:00 am at the Sewickley Presbyterian Church 260 Bells Mills Rd. West Newton, Pa. 15089 with Rev. Chuck MacPherson officiating. Interment will follow at the Mill Bell Cemetery in West Newton, Pa. In lieu of flowers, the family wishes for donations to be sent to the Westmoreland County Food Bank 100 Devonshire Dr. Delmont, Pa 15626 or Boys Town 14100 Crawford Street Boys Town, NE 68010. To leave an online condolence, please visit www.beatty-richfuneralhome.com.